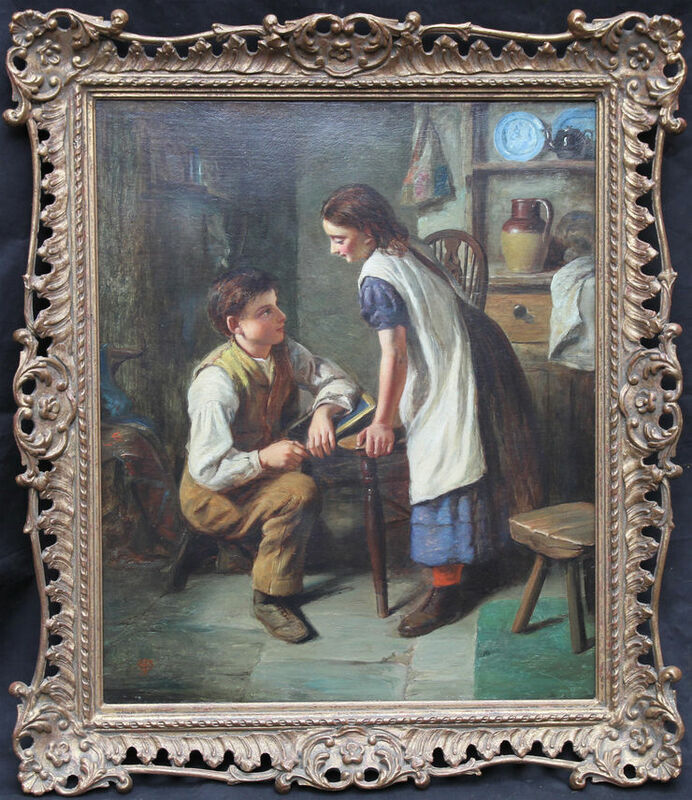 A very fine Victorian Genre painting by Joseph Clark. This beautiful oil on canvas was painted circa 1895. 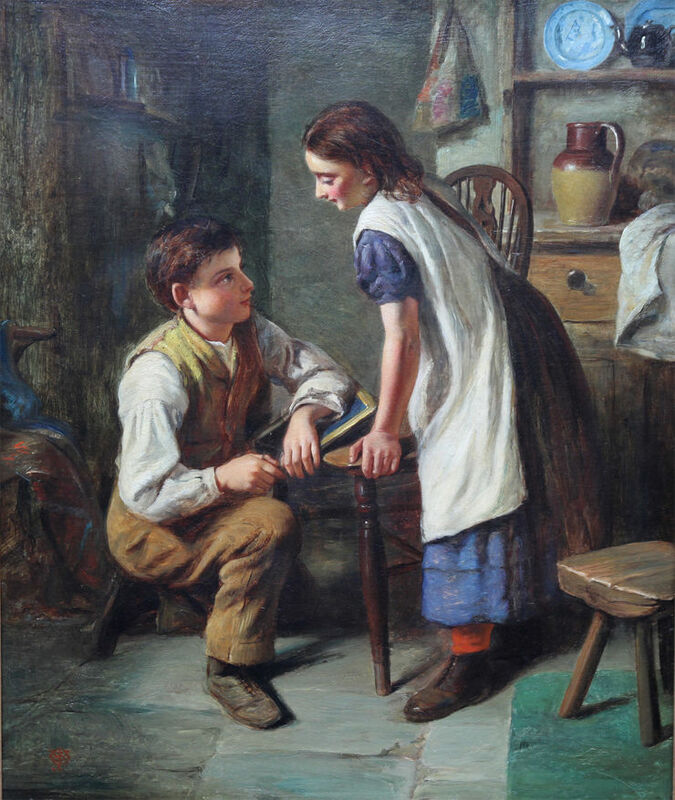 The painting depicts "The Marriage Proposal"; a young boy on bended need to his sweetheart in a kitchen. Signed left in monogram. Framed in a gilt gallery frame 32 inches by 26 inches. Very good condition. Joseph Clark (1834-1926) was born near Dorchester, Dorset. He studied painting in London under J. M. Leigh (1808-1860), who was himself the only pupil of William Etty, RA (1787-1849), the celebrated painter of classical and historical subjects. Clark specialised in depicting domestic genre subjects of a tender nature which generally featured children and he also painted a small number of biblical subjects. In 1857 at the age of twenty three he exhibited his first painting at the Royal Academy and he continued to exhibit there for all but two of the subsequent forty seven years. Many Victorian painters sought to demonstrate their social conscience through emphasising in their paintings the importance of family life and Joseph Clark was no exception. Whilst avoiding the overly sentimental style of some of his contemporaries, he frequently chose subjects which sought to remind people of their good fortune in having a caring family at a time when many children grew up as orphans in workhouses. Clark enjoyed considerable success with his paintings, maintaining both a London house and a home in the country for much of his life. In 1876 he was awarded a medal in Philadelphia for his paintings 'The Sick Child' and 'The Nest'. The Chantrey Bequest purchased two of his paintings, 'Early Promise' in 1877 and 'A Mother's Darling' in 1885. Exhibited : Royal Academy 1857-1904, British Institution, Royal Society of British Artists, Suffolk Street, Royal Institute of Oil Painters, New Water - Colour Society, Grosvenor Gallery, Birmingham, Dudley, Glasgow, Liverpool, Manchester.